Since the School of Education and the College of Continuing Education merged in 2017 to become the Alan Shawn Feinstein College of Education and Professional Studies, the University of Rhode Island’s continuing education programs have shrunk significantly while the School of Education has expanded. When the new college was created, a two-school structure was set up: the School of Education and the School of Professional and Continuing Studies. Under the leadership of Dean Anthony Rolle and Assistant Dean Tammy Warner, who are in charge of the Feinstein College of Education and Professional Studies, the education side of the college has grown in enrollment and opportunity. On the other hand, multiple faculty and staff have expressed concerns over what appears to be a disintegration of the professional and continuing studies branch as well as lack of transparency and communication. According to Kat Quina, the former associate dean for what was the College of Continuing Education, URI had the fifth largest degree-granting continuing education program in the country in 2008. At that time, a student could earn their entire degree in Providence from seven different programs. “About the time I became associate dean, we really transitioned, and we turned into more of an urban center and we began looking for audiences and it drew a much more culturally, racially, ethnically diverse audience,” Quina said. 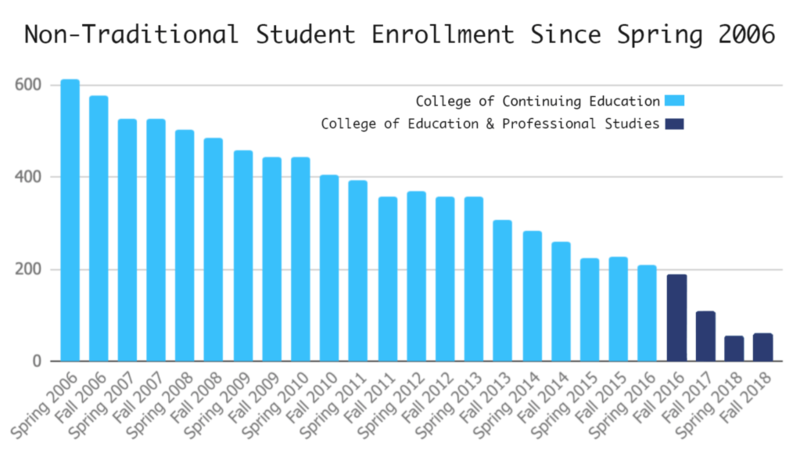 The School of Professional and Continuing Studies enrollment has declined from 502 students in 2008 to 60 today, according to the Office of Institutional Records. The enrollment dropped by more than half between 2017 and 2018, when the two schools merged. Communication Studies professor Vince Petronio, who has been involved with the branch since 1982, criticized the current situation in Providence. During the merger, Petronio mentioned that many meetings were had and questions were raised about the future of continuing education. Academic Advisor Jeff Johnson experienced the merge and all of the internal confusion that came along with it. Johnson and Petronio both feel that with these changes, local adult students no longer have a viable degree-granting option at the University. One key area of contrast between Rolle and many of the faculty members is that they have opposing views on what continuing education can be defined as. “Continuing education typically is associated with folks who either do not have a degree and want to kind of put a toe in the University to begin to understanding the process or continuing education is for folks who already have a degree and want to do some type of post baccalaureate work before entering a masters program,” Rolle said. Johnson, Petronio, Quina and a member of the School of Professional and Continuing Studies who chooses to remain anonymous see continuing education as a long-term degree-granting program, particularly for non-traditional students. With the merger and the movement of all bachelor of arts programs outside of education to the Kingston Campus, Petronio feels as though it will be impossible to properly serve these non-traditional and it could be part of the reason why their numbers are dwindling. He believes that advisors at the Kingston Campus aren’t equipped to advise non-traditional students. “You can’t administer that student the same way you can an 18-22 year old. I mean, it’s ridiculous to think you could,” Petronio said. Quina also felt as though what made the College of Continuing Education special was that faculty knew how to deal with students of all ages. “Faculty were there on campus so students had people to go to, and those are really the key elements, those kinds of factors are very important. It’s almost like you have to have a whole different attitude when dealing with continuing education,” Quina said. Petronio also added that a reason the continuing education programs did so well was because of past deans’ focus on making the Providence campus a comforting place for the adult student, rather than trying to be an extension of the Kingston campus. As a result of the low enrollment, many classes that were previously offered are no longer available to students. Upon reviewing course offerings through the school’s e-Campus portal, about half of the classes for the schools only current major, the Bachelor of Interdisciplinary Studies, could not be found for students to enroll in. Rolle explained that the faculty that were once a part of the College of Continuing Education have returned to their original colleges, and with the new organization of the colleges, it is up to the other Dean’s to decide if they would like to offer courses in Providence or not. The previously offered Bachelor of Arts programs are not degrees granted by the School of Professional and Continuing Studies, but by the other academic degree granting colleges at URI. 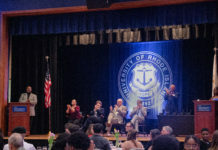 “Other colleges may also offer their courses in Providence as well, but that’s a discussion that I will have with their deans about what is most appropriate for their colleges to provide in terms of undergraduate classes and graduate classes for students in their colleges on the Providence campus,” Rolle said. Rolle added that the Bachelor of Interdisciplinary Studies is currently the only approved major for the School of Professional and Continuing studies, and that he is in the midst of propelling a degree in professional leadership and nonprofit administration through the faculty senate so they can be made available to students and begin hiring faculty for those programs. They are also currently in the process of redesigning the BIS to become a three minor-major program, where students can choose three minors from across the University and complete those programs with the help of advisers from those departments. Warner added that these programs will give students an overall better experience, and allow them to leave with greater qualifications and opportunities. The School of Education side of the Feinstein College has seen an increased amount of financial donations, considerable rise in enrollment, expanded study abroad options and modernization of classroom spaces. Records from the Office of Institutional Research show that enrollment in the School of Education more than doubled between 2017-2018. Alan Shawn Feinstein and Carolyn Hunter have increased their contributions to the school, that can be used for scholarships and other financial aid needs. The donation that Feinstein gave to the college will be used for Rhode Island high school students who are coming in as Feinstein Junior Scholars, have a need for financial aid and have been accepted to the Feinstein Leadership Scholarship Program. Hunter has pledged an additional million to the $200,000 she is currently donating. “If you are a student in Rhode Island and if you’ve ever been a Feinstein Scholar and you’re interested in education, Mr. Feinstein has generally increased his donations and contributions,” Rolle said. Modernization to classroom spaces in the Shepard Building, which is the home of the University’s Providence Campus and the college, have resulted in technology advancements and opportunities for non-traditional styles of teaching. Rolle said a new classroom will seat 72 students and has 12 computer screens and have two 84-inch screens in the front. Rolle is also seeking to create international opportunities that will be available to students as soon as next fall. “We believe that students need multiple experiences and multiple contexts to understand the world around them so they can be better teachers or better nonprofit administrations or better professionals when they return home,” Rolle said. The school focuses on study abroad J-term and summer courses that will enhance student experiences. Some of these locations include the Caribbean and Asia. These trips will tentatively be available for students in the fall of 2020. Rolle said has a goal of breaking the college into the ranks of the top 100 public higher-education institutions in the United States. In the most recent U.S. and World Report rankings, the Feinstein college is No. 108 out of all public schools. With all of these improvements, Rolle and Warner envision a college that allows students to be locally engaged, nationally respected and globally involved. Rolle and Warner plan to continue their outreach and enhancements to ensure that in the future the Feinstein College will be noticed across the nation.